Red Hook, New York (the Mid-Hudson Valley, 100 miles due North of NY City). I was born and raised in a wonderful small town on the North shore of Long Island called Huntington, NY. Life was spent roaming the woods and living on the beaches in the summer. Horses were a passion from early on when at the age of 5, I was given a tiny volume of B&W photographs of various horse breeds. Riding lessons and several years at riding sleep away camps were all I had to fuel my passion. I remember a particular Brownie camera with great affection. I created my own photo albums which I looked at frequently. Photos of friends and family. Camp memories. Places we visited were photographed. I did not get my first “serious” 35mm camera until I graduated from college. A gift from my sister. It was her camera, a Canon FTB. I have used Canon cameras ever since. I am a traditional film photographer. My primary camera now is a Canon Eos Elan 7N with some zoom lenses. I buy all of my equipment used and don’t have much in the way of professional equipment. I work in B&W film that I print myself on Gelatin Silver paper in my basement darkroom. Very much a hand worked art form for me. Old school and very satisfying. All of my work is printed in limited editions of 15 and in particular sizes, because I feel that scale in imagery is important. I just bought my dream camera last winter. It is a Hasselblad 500 c/m medium format film camera that is about 50 years old perhaps. It creates a negative that is 2 ¼” square. It is a larger negative than the 35mm and will allow me more detail and the opportunity to print larger without losing image quality. But for now, I am learning to see square. It is very different from the 35mm rectangular image I am used to. I wouldn’t mind getting a Leica 35mm rangefinder someday as well. My influences tend not to be photographic. Because of my childhood experiences, I feel I am more influenced by painters, sculptors and designers. Particularly the modernists. I love the work of Georgia O’Keeffe, Henry Moore, Franz Marc, Boccioni, and the design work of Charles and Ray Eames, Earo Saarinen and Frank Lloyd Wright. I also have a strong affinity for primitive and Asian art. 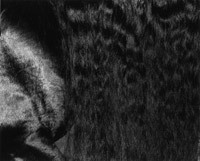 Of the photographers my strongest influences came from Edward Weston, Judith Turner and Frederick Sommer. I think my work reflects all that strong modernist influence. I began to take my photography seriously in my late 20’s. My work at the time was primarily architectural. Focusing on light, texture and shadow. Isolating pieces of buildings and objects. I received a MFA in photography from Cranbrook Academy of Art in Michigan in 1991, after I turned 33. It wasn’t until about 6 years ago that I started to work primarily with horses. I started with some local rodeos. Working with the extreme action halted within the small image frame. From there my work has progressed to intimate crops. Almost abstracting the horse. Like the architecture I used to photograph, I am working with light, texture, shadow as it appears on muscle groups, bones and coat patterns. I have no particular favorite breed. 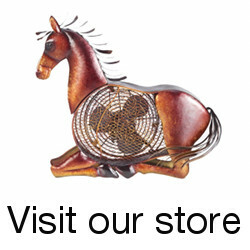 In fact, it does not matter if it is a show horse or a backyard donkey. They are all photogenic in my world. Although I do have to confess to enjoying working with the large area massing of the drafts. 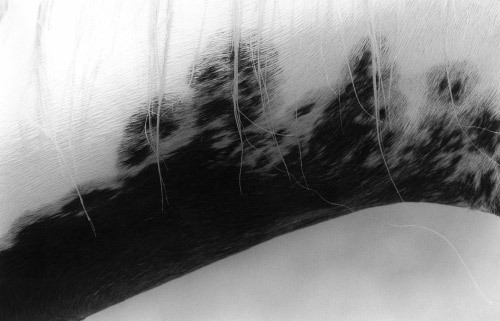 And I am interested in the different body structures of the different breeds and what that can offer in my imagery. I am unsure of my feelings about the impact of the Internet. Or perhaps, to be more precise, I am more concerned about the impact of the computer in general on the world of photography. The digital age has put the camera and the means of art production in everyone’s hand. In one way I cheer the innovation that again, brings the ability to create art to the masses and out of the hands of the elite. On the other hand this has looked like it spells the doom for traditionalists like myself. With fewer and fewer darkroom photographers, the producers of our materials (film, chemistry, papers) are going out of business in droves. Making the materials left harder to obtain and much more costly. It is also much more difficult to get the public to understand the difference between the hand-printed image and a digitally produced one. So, the creation as well as the marketing of the work becomes more difficult. The Internet itself has made access to shared information, support systems for artists and marketing venues at the tip of our fingers. I love that I have colleagues now around the world. And collectors that would never have seem my work otherwise. I have recently published a book of photography. It was printed via the internet and I have been selling it that way as well. The work of my heart is the series that I call Equiscapes. 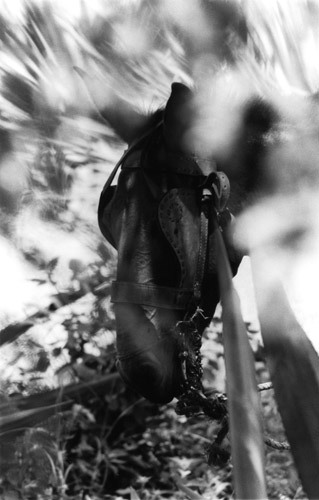 These images embody all that I wish to say both about photography and about horses. They are abstractions of the body that are in truth a visual touch. 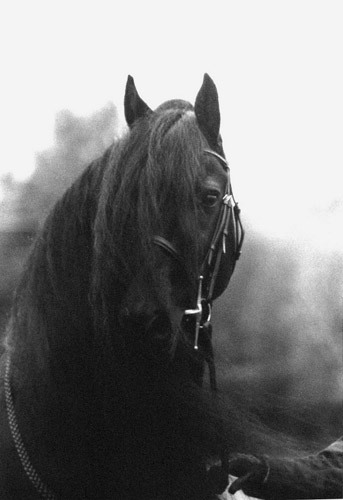 They are what a person working with horses, sees and feels. Up close. Not the whole, but the part your hand is on, you eye is looking for. The trainer watching a particular muscle group to see how it is working. The groomer who is touching the shoulder, tail, leg. These are what I want these images to evoke. And then something more. Part of the world itself. The landscape in equine form. This is what I am most passionate about. 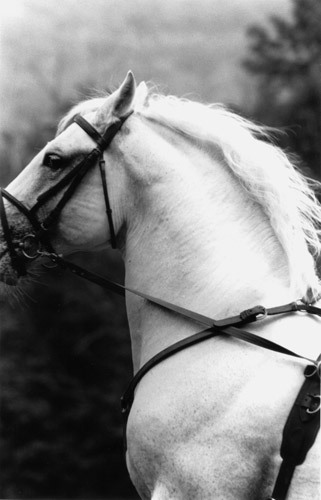 I am an artist working in the medium of photography, using the horse as my subject to speak to my viewers about the world as I see and feel it. Thanks to Juliet for answering the interview and sharing her photography. Be sure to subscribe to her photography blog to keep up with her latest shots. This entry was posted in Interviews on April 6, 2009 by The Equinest. Paige – Thank you so much! What a well-done article about a great photographer. Great to hear the important difference between traditional and digital photography. Thanks to both author and artist! Glad you like it Juliet, your photography is fantastic. Very interesting interview and I enjoyed seeing the photographs as well. Wishing you much success in future endeavors. Very nice, Juliet!! Such beautiful work. 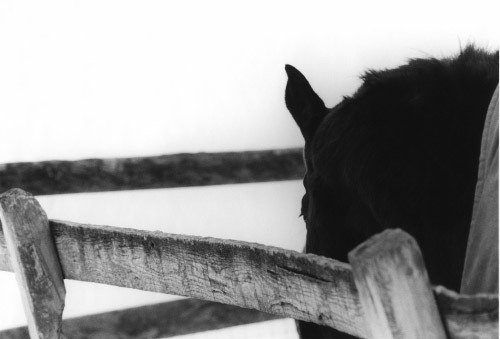 Juliet’s work is a favorite of mine – I love the seemingly stark simplicity of her compositions, which allow the planes of the equine form to take center stage apart from the sum of their parts. 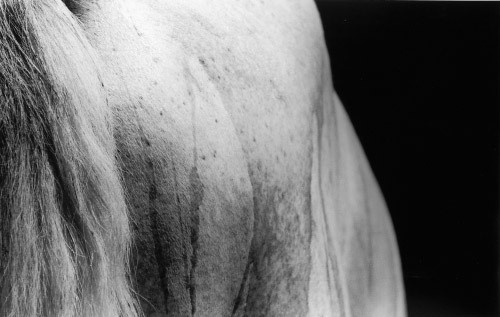 Horses are transformed when viewed through her lens. Thanks for such a nice article, Paige! how wonderful Juliet, your work is outstanding and I just loved learning just a little bit more about you! that is an excellent interview!! great post, thanks, I’ll be checking out your blog and these links! 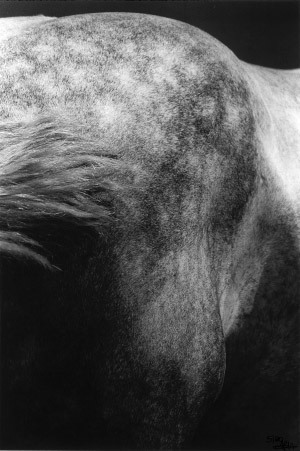 Juliet is a true artist and her love of the horse can be seen in her photography. She is an original! Thanks for sharing her with us!!! Juliet, it is so good to read more about you and your photography. It was a lovely interview. Juliet’s Footprint has always been one of my favorites. Brilliant to see the others are appreciating her work as much as I do! Fabulous interview Juliet and Paige. Stunning photography Juliet, as always a joy to see! What unique and beautiful perspective of the horse. The interview was quite revealing also. Thanks for sharing. Great Interview Juliet. Always a treat to see your work (and nice to bounce things off of you once in a while)Lets get together this summer! We’ll go back up to Sue’s.